Summer is almost here and that means bbq! I'm not the griller in the family, my uncle is the one who likes to grill. He does that several weekends through the summer whether at our house or his backyard. One of my favorites is smoked salmon grilled on a plank of cedar. He tried it for the first time last summer and it was delicious. Not to mention that salmon is rich in essential fatty acids like omega-3 and omega-6. These are great for keeping your skin clear from blemishes and pimples. And what girl wouldn't love clear and healthy skin. I look forward to some more of my uncle's smoky grilled salmon. What's curious to me is that he's cooking smoked salmon without using a smoker. He's using a plank of cedar soaked in water to grill the fish. Once exposed to the fire and covered, the cedar heats and smokes and the salmon cooks with a smoky flavor. I was not aware that this could be done but it's good to know. Also, you have to use untreated cedar plank that you can get from a local hardware store. Wood that's been prepped for decks and other special uses have been treated with chemicals. And that could be bad if mixed with your food. Soak cedar plank in water overnight. The original instructions say at least 30 minutes. Fire up the grill and once it's hot enough, put plank on direct heat and allow it to warm up. Mix olive oil, minced garlic, dill, and lemon zest in a bowl. Rub on salmon thoroughly. When plank begins to smoke, place fish on its surface. Move plank and fish to an area of indirect heat and close the grill. Let it cook and smoke for 25-30 minutes while checking occasionally. Before serving, sprinkle Parmesan cheese and squeeze lemon wedges. 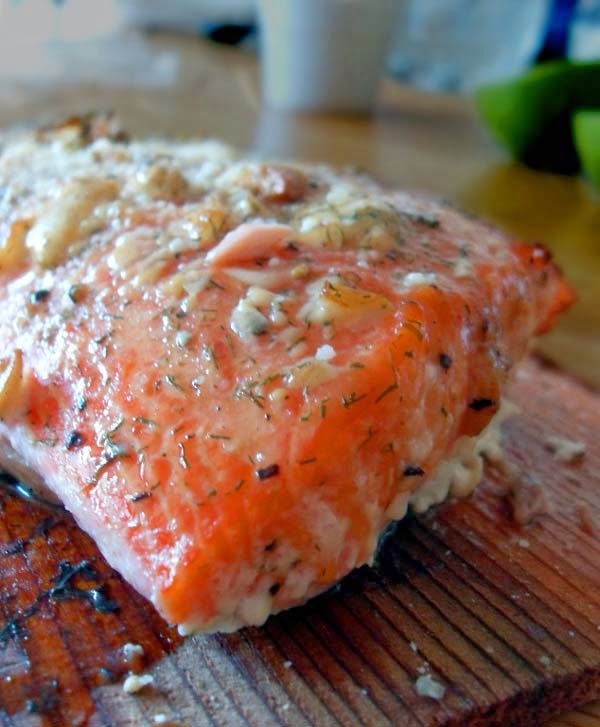 Here's a video on plank-grilled salmon to get a better idea on cooking this tasty summer dish.